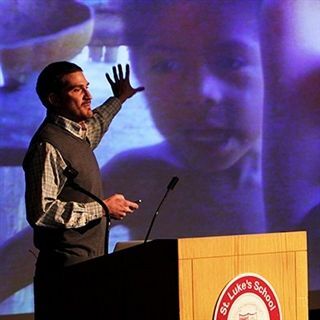 Each November, representatives from non-profit organizations are invited to talk with our faculty and students about all the ways to make a difference in the world. A conference-style format allows participants to choose workshops that spark interest. Recent presenters: Kids Helping Kids, DOMUS, Volunteer Square, and Neighbors Link. Students may also offer workshops where they share their personal passions and strive to get their peers involved. Syposium Symposium keynotes include Bryan Nurnberger, founder and president of Simply Smiles; Conor Grennan, founder and board president of Next Generation Nepal; and Mike Duggan, executive director of DOMUS. Kids Helping Kids enlists the help of US students to sort and distribute gently used shoes to those in need. A panel of local non-profits share how they turned their passion for a sport into a meaningful way to build communities, promote positive self-esteem and create long-lasting lessons about character. Me to WE: Charlotte Seiler '12 leads describes her experience with Free the Children at We Day in Toronto, Canada. SLS Parent Jennifer Kelley, co-founder of Kids Helping Kids shares tips on finding grant money to seed a dream project—turning a passion into action. Patti Russo, President of the Women’s Campaign School at Yale University, leads workshop 'The Politics of Politics' which focused on public service.